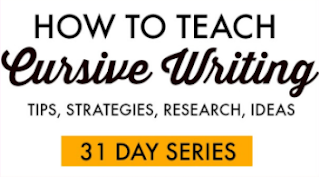 This post is part of my 31 Days of Occupational Therapy series where you can find 30 more ideas like this one with easy treatment materials. 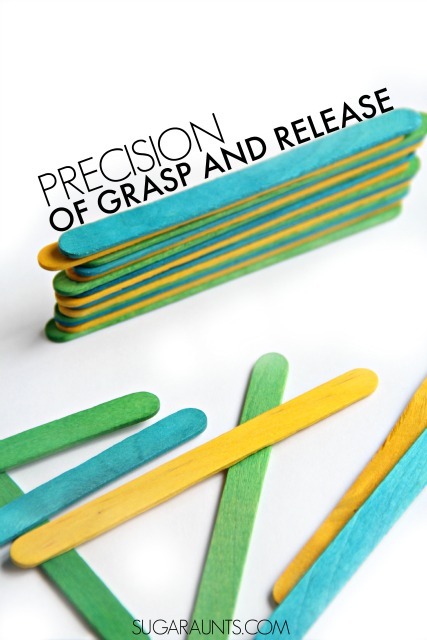 What is precision of grasp and release? First, it's important to note that a child's ultra fine motor dexterity is dependent on bigger things. 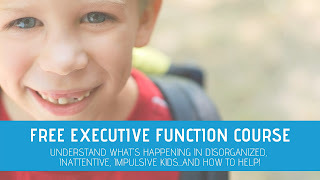 And by that, I mean that for a child to use their hands super fine motor tasks, they first must demonstrate strength and control of their core, shoulder, and arm. 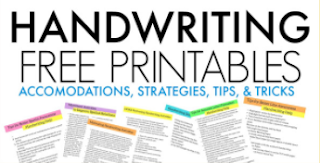 If any of these areas are not fully developed in stability or control, then the child will show compensatory strategies as they try to use their hands in handwriting or cutting with scissors. 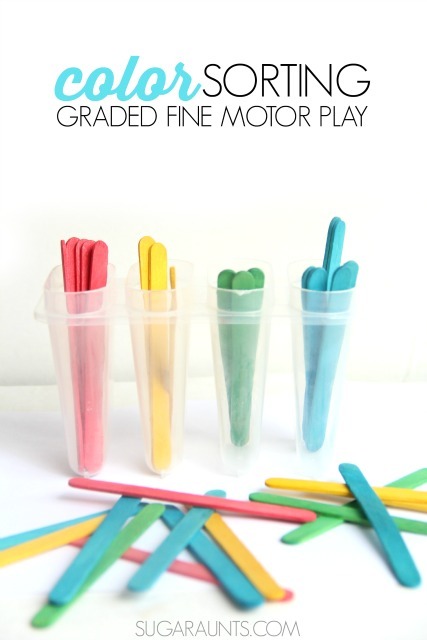 RELATED ACTIVITY: Try this DIY Pick-Up Stick Activity to work on Precision Skills. 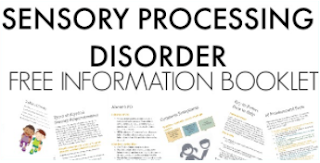 Precision occurs with development of grasp when child to use the pads of the index finger, middle finger, and thumb to manipulate objects with opposition. I talked a little about strengthening these grasps here. Today, I'm sharing ways to work on the controlled use of these fine motor patterns in controlled dexterity tasks. The precision of grasp and release is essential for very small motor movements in activities like picking up beads and releasing items like blocks with precision. Precision release is needed for stacking blocks without toppling them over, placing cards on a pile, opening scissors just a small amount, or placing small beads into a bowl. Precision is needed for a child to let go of an item in a controlled manner. If they are not exercising precision in release, you might see them rolling or tossing an object as they let go. They will knock over a stack of blocks, or over open the scissors when cutting lines, making their accuracy very choppy. Precision in grasp is related to the picking up of items. A graded lateral grasp is needed to cut with scissors and only squeeze the scissors halfway shut for accurate cutting lines in some situations. Around 3-4 years, a preschool aged child typically develops a greater variety of grasping patterns, including precision. They begin to grade their scissor strokes so that they can cut a line or shape without opening and closing the scissors completely. Grasps in babies typically begin with a raking motion and work towards a pincer grasp. Precision in this skill occurs when the child is able to pick up very small items like beads with accuracy and graded movements. 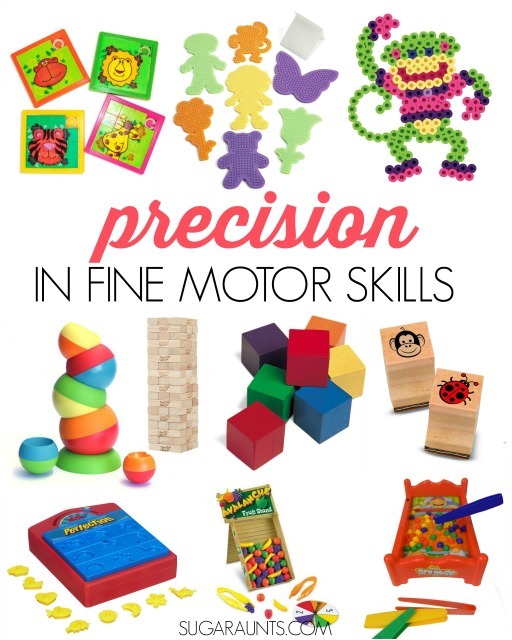 Precision in rotation is another task that children develop around age 5. Rotation is a portion of in-hand manipulation and seen when turning a coin on the edges and the child rotates it in a circular motion. Precision in rotation also occurs when holding a pencil between the fingers and the child rotates it over and over. To practice precision in grasp and release, I showed my preschooler how to pick up and stack Popsicle sticks. Picking up the sticks required a tip to tip grasp. 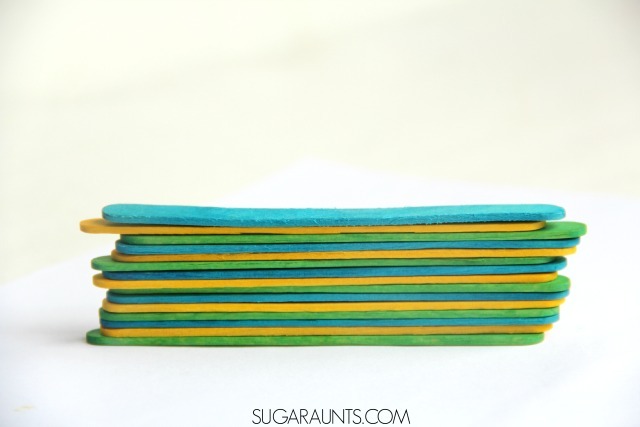 We used different colored Popsicle sticks (These ones are from our friends at www.craftprojectideascom.) for my 4 year old and my 17 month old. The preschooler was able to pick up the sticks accurately without pushing other sticks around. She could grasp the specific stick she wanted by an end or middle accurately. The Toddler grabbed the sticks with a pincer grasp, but showed much less accuracy. We used an empty Popsicle mold to place the sticks into the cups. What a great way to practice grasp precision! We worked on sorting the craft sticks by color and had to hold the mold with one hand to work on bilateral hand coordination. 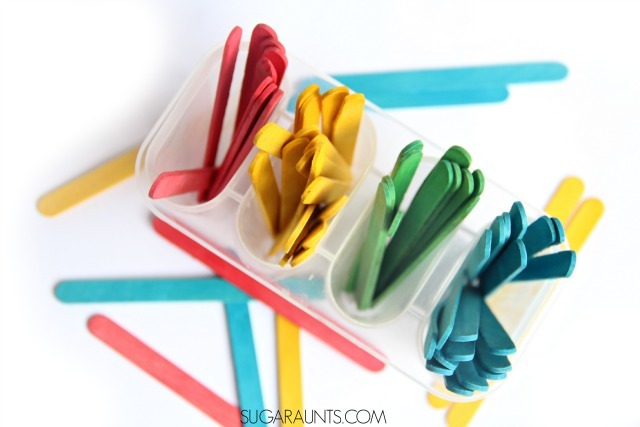 For the activity, we placed the mold on the floor and sorted the colored sticks without knocking the Popsicle mold over. Both the preschooler and the Toddler loved this simple activity. Another precision in release activity was simply stacking the craft sticks. The four year old could do this, but used her non-dominant hand to stabilize. 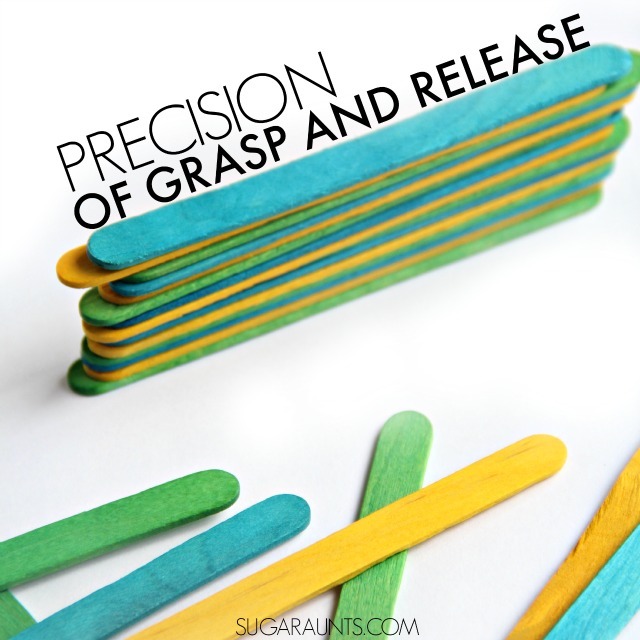 Looking for more ways to practice precision in grasp, release, and rotation with Occupational Therapy students or your kids? Try some of these ideas. While they are not all free (going with our series this month! ), they are creative ways to practice precision. Try manipulating Perler Fuse Beads with Pegboards for precision in grasp and release. These pegboards are very small and work on very fine dexterity with precision. Stamp sets are a good way to practice graded grasp and release. Use these stamp blocks to accurately stamp within a specific area on a page. Draw squares or circles and the child needs to stamp in those areas. Tweezer games and activities like this Bed Bugs Game encourage a precise and graded grasp and release of the small game pieces using tweezers. This game is on my must-buy list for Christmas this year! This Avalanche Fruit Stand is another fun way to practice precision with a pair of tweezers. Stack the fruit with precision of grasp and release in a fun and colorful way! The Perfection Game is another game that is great for precise grasp and release. Encourage kids to rotate the pieces by twirling the peg of the game pieces to work on precision in rotation as well. Jenga is a precision work out in grasp and release of the blocks. My kids love this game! Stacking blocks is a precision pattern activity that is perfect for working on graded grasp and release. This Tobbles stacking toy is a version of that, with bright and bold colors. Try stacking and taking these balls down without knocking them over! Sometimes, simple is best! These Wooden Color Cubes are perfect for simple block building and stacking while working on precision of grasp and release. Kids need precision of the thumb, too. These Slide Puzzles are not only fun, they work on small motor skills needed for graded movements in cutting and pencil control.